So, now I need to cook 20 cabbages. Day 1: stir fry cabbage, tofu, and bell peppers served over ramen, with a salad on the side. I used only one cabbage. It was yummy, the next night, I ate the leftovers. 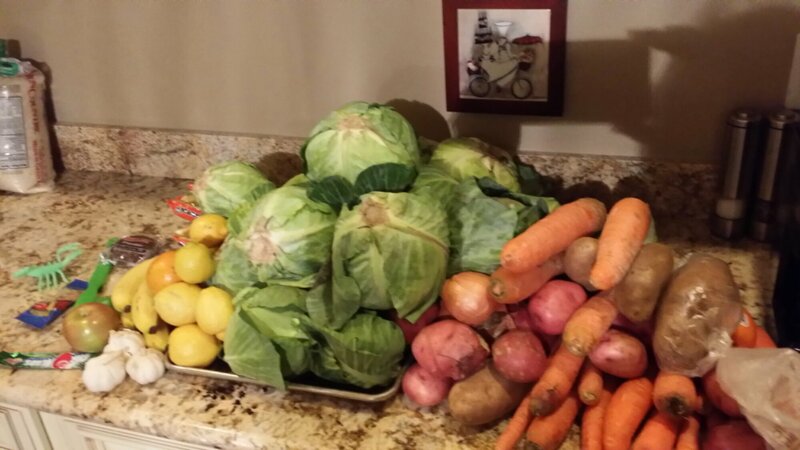 As not to miss an opportunity to use some cabbages, I blanched 4 cabbages, two shredded, and two quartered. Then, froze them; postponing the decision of what to do with four of them. Cook the rice as Rach instructs (use 2 tablespoons butter to brown 1/2 cup orzo. Add 1 cup rice, stir. Add 2 1/2 c chicken stock and simmer for about 15 min (or until water disappears). I had some orzo/rice stuck to the bottom of my pot. Not sure how to avoid that. Brown 1 lb of ground meat seasoned with salt and pepper. Add 1 diced onion, 5 cloves minced garlic. Season. I used cinnamon, fresh dill, and dried parsley. Mix rice and meat in a bowl. Boil 12 large cabbage leaves to soften. Let them cool in cold water. In the skillet used for the meat, heat 1 cup tomato sauce, 1 cup chicken stock, and 5 small tomatoes (diced). Season with salt, pepper, and dried parsley. Stuff the cabbage. Start rolling near the thickest part, tuck the sides in, then roll. Place seam-side down in the pan. Simmer for 30 minutes or so. I’m about to freeze my leftovers. They were delicious! I don’t even like stuffed cabbage usually. I now have a craving to do this again using ground lamb meat. Instead of pancetta, I used thin-sliced bacon. I am partial to bacon-wrapped anything. I prefer my panchetta with a nice baguette. Since I love celery, I doubled the amount of celery in the recipe (I had salad for days afterwards). Instead of grilling, I cooked the bacon wrapped shrimp in a pan on the stove-top. I cooked them until the bacon was nice and crispy. In the lemon juice for the shrimp marinade, I added a little lemon zest. As usual, I added some sea salt and coarse ground pepper to finish the dish. Surprisingly, I followed the rest of the recipe. It is not usual for me to stick that close to a recipe. I tried to serve this to David since it was so delicious, but he hates fennel. He made faces when I made him try the fennel fronds, which I find barely taste like anything. However, a well-balanced bite of 30% bacon, 50% shrimp, 10% celery, and 10% fennel tasted delicious to him. 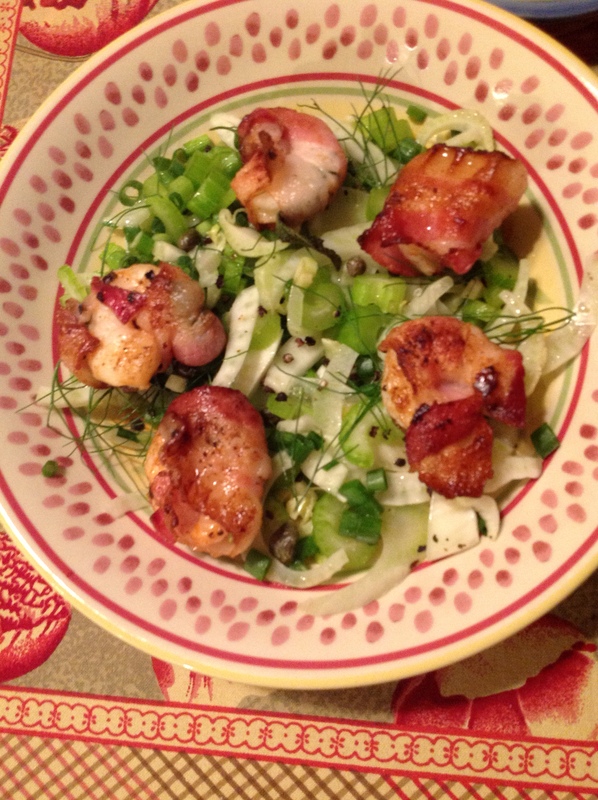 Bacon does make everything taste better (although, I think fennel tastes good to begin with!) Ok, I am hungry now. With pizza, it’s all about the crust. But, it’s hard to make good crust at home. Usually, I cheat and just purchase pizza dough at the store. Dave, however, does not like the store-bought pizza dough, so he has investigated the secrets to a good crust: buy the dough from a pizza place, and use a pizza stone and pizza paddle. When this month’s issue of Everyday with Rachael Ray came in, I decided to make it with the dough from a local pizza parlor. We don’t have the stone and paddle yet, but I followed Rachael’s recommendation to use an upside down cookie tray as a fake pizza stone and to place the pizza on parchment on a second tray. The lesson I learned: don’t follow recipe directions for store-bought pizza dough with pizza-parlor-bought pizza dough. We placed the dough on parchment paper … and it stuck. When we were eating, Dave was biting the pizza off of the parchment like you bite candy dots off of the paper they come on. I used a knife to scrape off the filling of the pizza from the crust/parchment. The pizza was delicious, but a complete and utter disaster. [The stone and paddle are on our wedding registry though, for anyone reading who wants to make Dave happy]. The title to this post is a bit misleading. Dave and I decided to make chili to bring to a new year’s eve party. 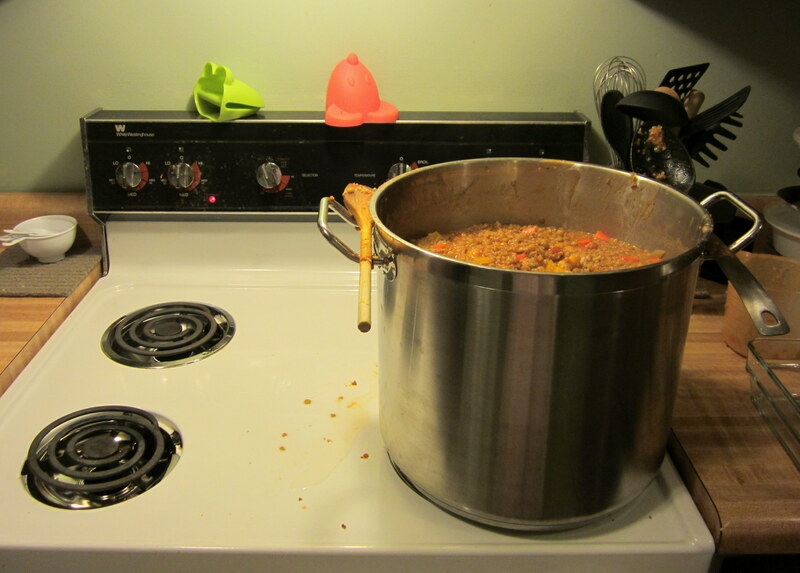 It wasn’t particularly cold that day at 65 degrees, and we didn’t just make “a little chili”…we made 5 gallons! (I blame Dave who told me to double my recipe so we would have some left overs. He might blame me for making a recipe for 2.5 gallons to start with and calling it chili for 8 people). Bring this to a boil, adding water as needed. Then, simmer for 30 minutes. Finally, add 5 stalks celery, diced. We chopped up an assortment of hot peppers on the side (2 serano peppers, 1 jalapeno, and 1 habenaro). That really heated things up! I liked mine with banana peppers from a jar. Due to time (and space), we did not add the kidney beans, but those would be a good addition to the dish. Perhaps they will make it into one of our reheated chili dinners. We accidentally turned a small dish into leftovers for life.